The 2014 Commonwealth Games are alive and well and they’re taking place in Glasgow, Scotland. Australians customarily do extremely well in the Commonwealth Games (with the Olympic medal threats of the United States, Republic of China and Russia not participating due to their non-Commonwealth status), and hence, sports commentators and spectators alike tend to get very excited. Because everybody loves a winner. But it also seems as though everybody loves our choice for Australian flag-bearer for this year’s opening ceremony in track cyclist champion Anna Meares. She is undisputedly a champion of Australian sport, boasting an impressive repertoire of four world championships, and gold medals at both Olympic and Commonwealth Games. It is not just her supreme ability on a bicycle that makes Meares such a champion of Australia; it is the obstacles she has had to overcome, along with her enduring spirit and personality. 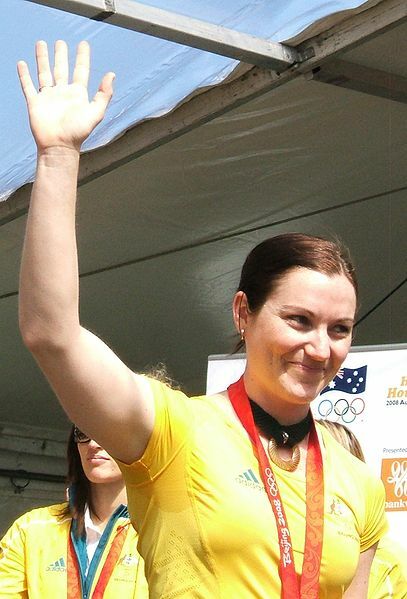 Thirty-year-old Meares became interested in cycling at the age of eleven after watching the 1994 Commonwealth Games track cycling event. As she originally resided in Blackwater, Central Queensland, it was a drive of over two hours to reach Mackay to get to the nearest cycling club, which is where both Anna and her sister, Kerrie, trained and developed their passion and love for the sport. The sacrifices and long trips paid off for the Meares family, when in 2001, Anna was awarded the Australian Junior Women’s Track Cyclist of the Year, and again in 2002, when Anna narrowly missed out on the bronze medal at the Manchester Commonwealth Games in the event of the 500-metre time trial, and sister Kerrie won the gold. By the 2004 Athens Olympic Games, Anna had won a gold medal and set a new world record in the women’s 500-metre time trial. 2004 was a fruitful year for her, as she also accomplished the title of Women’s World time trial champion in Melbourne, and won a silver medal for the sprint event. She also won the same event at the World Cup held in Sydney in the same year. It was her achievements in Athens, however, that saw her awarded with the great honour of an Order of Australia Medal. She continued to improve and better herself over the next few years, breaking her own world record – twice – in 2007, and winning four of the six medals awarded to the Australian Cycling team in the World Championship in the same year. Despite these shocking injuries, and, one assumes, mental deterrents from ever getting on a bicycle again, she was, amazingly, back on her bike just ten days after the fall. She underwent relentless rehabilitation, and with the points that she had secured in the lead-up to her fall, managed to qualify for the Australian cycling team at the Olympic games – as one of only 12 cyclists. She proved her fitness and ability to fill the spot in the four and a half months in the build up to the games, which she did. Perhaps even more astonishing were her results in Beijing – she made it to the final-ride off for gold against Great Britain’s Victoria Pendleton, and while she didn’t win that race, her dogged determination in securing the silver medal meant that she would forever be considered one of Australia’s true champions. Following her eventful 2007/8 seasons, she has had continued success, including winning the gold medal at the London 2012 Olympic Games (once again, against Victoria Pendleton), and the bronze in the team sprint, numerous world track championships and two gold medals at the Delhi Commonwealth Games. Most recently, despite some concern that her responsibilities as flag-bearer might interfere with her cycling duties less than 24 hours after the Opening Ceremony, she has won yet another Commonwealth Games gold medal in Glasgow in the 500 metre time trial, and a silver medal in the sprint. It is her relentless fighting spirit, commitment and determination, more so than any number of medals, that has defined Anna Meares as a true champion of Australian sport, and a more-than-worthy face of the Australian team at the Commonwealth Games. This entry was posted in Sport and tagged chicks with balls, Opinion, sport. Bookmark the permalink.